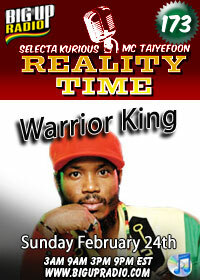 Conscious reggae singer WARRIOR KING guest stars on this week's REALITY TIME radio show. Hosted by the furious Seledcta Kurious and mighty MC Taiyefoon this Sunday February 24th, 2013. Reality Time brings you the latest reggae news, culture and exclusive interviews each Sunday on Bigupradio's 24/7 dancehall station. Tune in for this special interview with reggae sensation Warrior King. Showtimes are 3am, 9am, 3pm & 9pm EST. Warrior King was born on the 27th of July: 1979: in Kingston’-s Jubilee Hospital: soon moving to Clarendon: then settling in the growing city of Portmore at age eleven. More than 15 years of consistent participation in Northern California's reggae scene qualifies Kurious as an old dog among the Bay Area's myriad selectas and sound systems. Top artists like Luciano, Yami Bolo and Warrior King have contributed to his impressive collection of dub plates. This Oakland native has spun at every dancehall venue worth its salt and 'long side any and all reputable selectas in the area. Reggae heads come from all 'round to hear his generous mix of bashment, ganja man and God-bless riddims every time he shows up to the dance. For the last 5 years Selecta Kurious has been the co-host and dj for his very popular Internet radio show Reality Time. Broadcasting every Sunday and internationally reaching tens of thousands of devoted listeners weekly, Selecta Kurious and Mc Taiyefoon have over 150 shows under their belt and have interviewed and hosted the who’s who of Reggae artists: Barrington Levy, Eek-A-Mouse, Sugar Minot, Pato Banton, Lucky Dube, Tony Rebel, Jr. Reid and Yami Bolo, just to name a few. Taiyefoon is Oakland born and grown. He began his radio career at Cal State Hayward where he hosted the university's popular hip-hop/reggae show Rip City Radio while studying broadcast media. The gentle giant has absorbed the reggae scene since the Reagan era when Eek A Mouse was an Omni regular and Sun Splash annually accompanied the arrival of spring at Berkeley's Greek Theater. Currently, Taiyefoon is host and producer of "Full Circle," KPFA's weekly culture magazine. Together they bring you Reality Time Reggae.